Hello! It's time for another fun challenge from Paper and Such! The theme this time round is Our Feathered Friends. I used the Paper and Such, Song in My Heart set for my card. I tried something a little different this time. I colored around the image instead of coloring the image itself. I really like the look alot and I'm sure I'll be trying it with other images. Thanks for stopping by and have a great day! 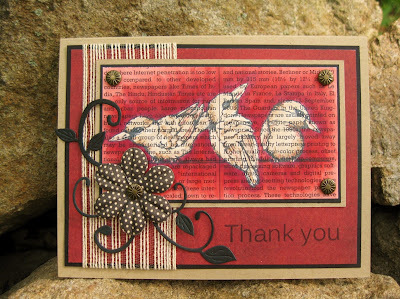 What a beautiful card, I love it!! Great color choices!! Love all the details! Beautiful! Love that flower too! I love this Janice, what a creative way to showcase the birds! Very creative! Super awesome card! I don't know how i missed you posting this one it is fabulous Janice!